You’re a wine lover who’s dying to start a collection. You drool over photos of others peoples’ expansive wine cellars, with their rows upon rows of bottles just waiting for the perfect day to be opened. But you don’t have a handy underground space, or an extra room that can be converted into the wine cellar you covet. You might live in a small house or even an apartment. But just because you have a small living space doesn’t mean you have to give up your big wine cellar dreams. Vintage Cellars is no stranger to the challenges of building a fully-functioning, temperature- and humidity-controlled wine cellar in a small space. For homeowners in San Diego, CA, Vintage Cellars had just 80 square feet to work with, but managed to build the perfect space to neatly house 750 bottles. Of course, no space, no matter the size, can be a successful wine cellar without the proper sealing, vapor barriers, and installation. Vintage Cellars experts took the care to outfit this small space just like they would a more traditionally-sized wine cellar. And just because the cellar is small doesn’t mean it’s lacking in the looks department. Clean-lined glass doors both show off the wine and open up the relatively small space. Vintage Cellars also installed adjustable shelving to house the homeowners’ special collection of large-format bottles. The shelving allows the clients to showcase this unique aspect of their collection, giving it a personal touch. But what if you don’t have the ability to knock out a wall to build the small-scale wine cellar of your dreams? Even if you’re renting a small apartment, you still have options. One great space-conscious choice is a wine refrigerator. 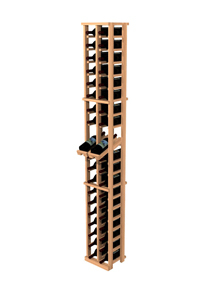 This wine cabinet by Vinotheque holds 448 bottles, and can be housed in an out-of-the-way corner or even a garage. Still too large? This credenza-style wine cabinet holds 216 bottles, and can double as a buffet in a dining room, or even act as a console table in a hallway. Still don’t have room? This small-scale wine refrigerator from Marvel slides right underneath a kitchen counter, and takes up just 15 inches of space, while holding an impressive 23 bottles. It may seem like you need an enormous mansion to house a wine collection. But that isn’t true. With a little imagination, you can store your bottles no matter what your living situation, whether by building a small-scale cellar into your house, or by simply sliding a tiny refrigerator underneath an existing counter. You’re a wine connoisseur. You spend every spare moment reading up on the greatest vintages and hunting down that perfect bottle. But do you ever feel like your hobby is confined to the wine cellar? With your collection shut away, it’s easy to feel like your passion takes a backseat. How to integrate your love of wine into your home? 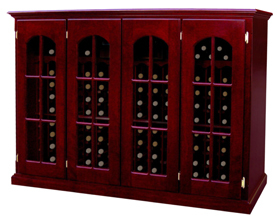 One great option is to use specialty wine furniture. Howard Miller designs stylish furniture that is a great way to showcase your love of wine. From inviting bar stools to ornate wine cabinets, wine furniture allows you to bring your passion out of the cellar and into the most lived-in areas of your home. No wine lover’s home is completely without an elegant bar area. A bar is a great place to open and decant wine bottles and of course, mix up the occasional cocktail. Howard Miller bars have luxurious Italian marble tops, and are adorned with carved details. The bars offer chilling drawers perfect for storing wine, wine racks, and a variety of finishes to complement your decor. And no bar would be complete without a place to sit and enjoy your cocktail, so Howard Miller offers a variety of bar stools as well. Built to seamlessly match the bar, these bar stools truly complete the look. 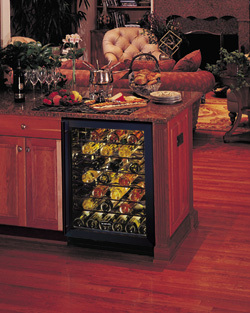 Wine cabinets are a great way to make your wine collection fit seamlessly into your home. Wine cabinets come in a choice of high-quality finishes, with details such as carved feet, built-in wine racks, and lighting. 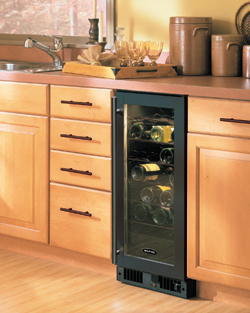 For a wine cabinet that doubles as a bar, choose a model with stemware storage built right in. With so many customizable options, you can find a wine cabinet that both houses your collection and makes a beautiful design statement. Howard Miller wine console. 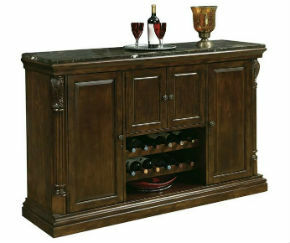 Consoles offer the storage of a wine cabinet with the counter space of a bar. Use a large console in your dining room: it doubles as an place perfect for holding a holiday-worthy buffet. Use a small console to fit that empty corner: the top can display photos from your travels to wine country, while the storage space holds your bottles from the trip. With a variety of models available, it’s easy to find the one that perfectly fits your collection’s needs. Looking for an alternative to an actual wine cellar in your basement? Ever consider a freestanding, walk-in wine cellar? That’s right! Vintage Series wine rooms are easy-to-assemble, walk-in wine rooms that are all-in-one wine cooling and storage facilities. 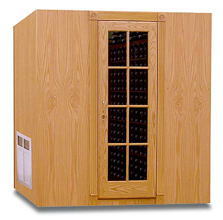 Made from reinforced panels to prevent warping, and featuring a built-in Breezaire cooling unit to ensure precise wine storage temperature control, the Vintage Series Wine Room 2600 is an excellent, self-contained alternative to a traditional wine cellar. You’re even able to customize your Vintage Series Wine Room by selecting an appropriate wood type and stain of your choice. Your unit’s door can be made of solid wood, or you may opt for a door with a window. You’re also able to add split panels, interior lighting, double insulation, and a security lock to your wine room, if desired. 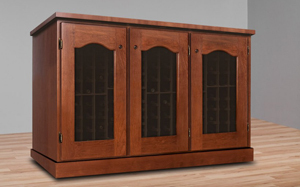 The Vintage Series Wine Room 2600 features a premium Breezaire cooling unit, a natural oak and mahogany interior, quality redwood racking, empty floor space to stake cases of wine, and a 3-year warranty on the cooling unit and cabinet. What is more, this wine room can hold up to 2,540 bottles of wine. For a freestanding wine room, a capacity like this is fantastic! For less than half the cost of having your boiler and hot water tank replaced (based on average replacement costs), you can have an attractive, fully-functional wine room in your own home! Consider this, or one of our many other wine room options, as a practical option for nearly any home. Need more information? Give us a call at 1-800-876-8789 and one of our wine storage experts will be delighted to help. This rich, dark red hails from the Limoux region of Southern France. With sufficient aroma, the Le Grand Pinot Noir 2009’s nose consists of delightful red berries, cherries, raspberries, currants, and a note of fig. The wine is rounded, and delights the taste buds with exploding flavors of red berries, cherries, and currants. Its semi-spicy kick is nicely countered by its smooth, balanced, satisfying finish rich with tannins. Though not an extremely complex wine, the Le Grand Pinot Noir 2009 is quite good considering its average low price of $8.99 a bottle. In fact, I find the wine to be better than some higher-priced red Burgundies. Pairing well with salads, various cheese platters, game birds, and fish dishes including salmon and tuna, this is a good wine to enjoy with light, summertime fare, as well as with hearty pork! Although Le Grand Pinot Noir’s logo may contain a black sheep, this wine is certainly an inexpensive winner in my book! Because this is a such an inexpensive, versatile wine, this would be an excellent choice to purchase by the case when throwing a party. To really impress your guests, store and serve from an elegant wine credenza, a combination wine storage cabinet and serving table!